Our IDF 1-point bungee rifle sling is specially made for close quarters use, this sling made from top quality materials and features a unique bungee system that provides you with comfort and support. This 1-point sling allows the user to quickly switch positions for firing from standby position to combat shoulder position. 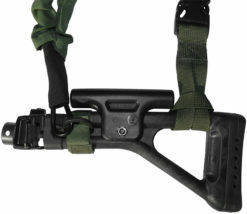 The one-point quick release sling is the best option for close tactical maneuvers, especially in close quarters. This one point sling allows for dropping the weapon to let it hang muzzle down and uses a heavy duty metal hook for added weapon retention and offers you the very best in comfort and support. There is also a side buckle for QR (quick release) of the sling from the user. This single-point gun sling is the perfect accessory if you are going on tactical maneuvers that will require you to switch your firearm from shoulder to shoulder like in weak side shooting for example. This tactical sling is fully adjustable for a comfortable fit even if you are wearing external vest and gear and can support the weight of all types of rifles that are compatible. Whether you are embroiled in a short term battle or controlling a riot the single-point bungee sling offers a unique design for use in crowded situations. When you are fully dressed in uniforms intended for tactical maneuvers the bulkiness limits the type and number of accessories you can add. The single-point sling is fully adjustable to comfortably fit over those bulky outfits. Plus, it comes with a quick release buckle system on the side. Designed with close quarter battle (CQB) in mind, the tactical sling allows for rapid repositioning from resting to combating in seconds. It can be worn on either shoulder and affords the rifle to hang muzzle down when not in use. This single sling is secured to the rifle with a heavy duty metal hook for added security. It is made of the highest quality nylon for dependability and extended durability. It is primarily available in three colors black, tan or army green. Israeli Weapons field tests all products to ensure the safety of the consumer and the effectiveness of the weapon.